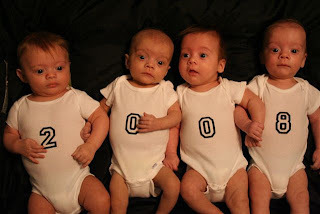 Goerlich Quadruplets: Welcome to 2008! 2007 has come to a close and we can’t help but reflect on what an amazing year it was. It started out with tragedy as we said good-bye to Chris’s dad on New Year’s Day (http://texasquadruplets.com/familyphotos.html). Tragedy quickly turned to praise as we learned we were going to be adding a little one to our family. Praise then turned to panic when we found the news of triplets….quadruplets….oh my goodness! Panic soon turned to faith as we learned to trust the Lord for all of our physical, emotional and financial needs as we anticipated the arrival of our four little ones. The babies arrived and instead of the excitement and relief that a new baby typically brings we were faced with a surgery, breathing issues, and other daily reminders of how fragile these babies still were. Anxiety battled the joy of this birth as we wondered if all four would make it home. And finally, the day came when all four were safe at home. At last, excitement! Yet the excitement soon faded to fatigue, fighting, worrying and wondering again. When were the blessings going to come? As we look back, they were there all along. Every step of the way we have been blessed - to learn and relearn trust, patience, peace and understanding through a tragedy, through a celebration of four little miracles and through the privilege of a challenge to raise four different little babies. As we look back at our website and scroll through the “Petals of Praise”, journal entries, and slideshows we are quickly reminded of how much we have learned and grown together on this rollercoaster of a year. Through the trials and triumphs, peaks and valleys, we are blessed, thanks to God, our friends and family, and the many others who are helping us along the way. There is no promise that the year ahead will be easier, but we have learned that the easiest years are not necessarily the best. Check out Mari's latest video creation, aptly titled Blessed, below or click on the link to view it full screen using Windows Media Player (don't forget to turn up your volume). So, what's ahead for 2008......stay tuned! Happy New Year! Home from the wild party - the best kind, spent holding one child, laughing with another, watching the older ones laugh over a video, and talking with good friends. What an adorable picture to open your blog! It is an amazing journey God has taken you on and I know that He will continue to guide you as parents and a family to trust and rely on Him. Psalm 90:17 is my prayer for you - that God may rest His favor on your family and establish the work of your hands. Mari and Chris, Happy New Years. I've had such a great time waking up early to feed the babes. It completely made my day. I do miss them. If you ever need anything, or a night out , or grocery shopping, let me know. I'm here for ya. God bless you guys and see you hopefully at church soon.